As Christmas is fast approaching, Bad Black is out of prison, Zari and Ivan Ssemwanga have reunited as a couple, exchanged Christmas gifts already to celebrate their rekindled love. The couple has gone ahead to share their latest photo together with Zari seated right on top of Ivan's office desk. This was followed by very many messages from friends and well wishers who were happy for them. Ivan's close pal, King Lawrence said that he could actually contribute Shs200m if the two were to wed. It should be recalled that Zari was a few days back trying on a wedding dress in one of the bridal shops down South so it does not surprise if Zari was giving Ivan an update on whether the dress was just right or they needed to try elsewhere. In the same vein, it will not be surprising if the couple is planning to wed this very year now that Zari has even dumped the basket ball player and told whoever cared to know that Its now official, she is not dating Isaac Lugudde. Ivan and Zari have three boys and the two have been together for about 12 years. 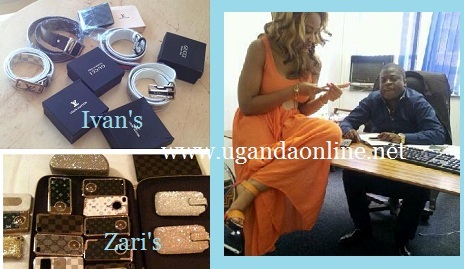 Zari introduced Ivan to her parents home in Munyonyo a day before Christmas in December 2011. The couple was forced to make up at least before that anniversary date bearing in mind that the introduction ceremony was one of a kind with all sorts of gifts in form of cars, cows, cash being passed on to Zari's parents. In August, the couple split with Zari citing domestic violence. During the break, the two were able to hook up somehow. Zari was with the basketball player as Ivan hooked up Nickita who looked more or less like Zari. Their in-laws were able to reconcile both parties putting an end to all those babes that were strategizing on hooking up with Ivan. The couple has now put their differences aside and are about to hit town to coordinate their respective events. Zari is organizing the The All White Party at Guvnor while Ivan is behind the First Ever Boat Cruise that will have over 200 booty-full babes boarding the boat cruise for free.